The label inside the instrument reads 'Thomas Kennedy, Maker, 16 Nassau St. Middlesex hospital, London 1814.' Also stamped on the upper back: 'Goulding'. Acquired at Sotheby's auction (Melbourne) in December 1992 by the Historic Houses Trust of New South Wales and now held in the collection of the Museum of Sydney on the site of first Government House [MoS93/2]. 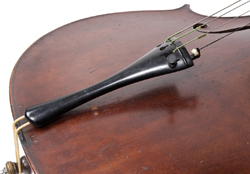 According to the vendor, family tradition claims that the violoncello was given by Elizabeth Macquarie to Mary Ann Piper (née Shears), wife of Captain John Piper, in 1822. My state of health prevents my being able to call on my acquaintances in this Colony to take my leave, I therefore take only the means in my power of assuring you of my good wishes for a long continuance of health, and prosperity to you, Captain Piper and all your family. 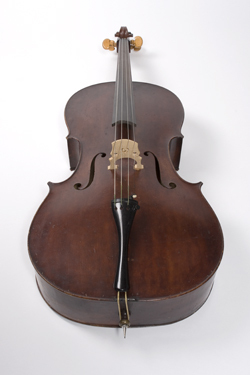 Ownership of the violoncello appears to have subsequently passed through the Doyle/Prior family who had close associations with the Piper property at Alloway Bank in the Bathurst region in the mid-C19th. 'Letter from Elizabeth Macquarie to Mrs. Mary Ann Piper'. 9 February 1822. Piper Papers Vol. 1. Original held in the Mitchell Library, Sydney. ML Ref: A254 pp. 533-534. Forsyth, Nicole. "Mrs. Macquarie's Cello and Colonial Sydney: Open Air Gaol or Picnic Pleasure Ground?" Unpublished paper presented at 28th National Conference of the Musicological Society of Australia 28 September - 1 October 2005 Sydney Conservatorium of Music. [MSA Conference 2005: Music and Social Justice].